Love at first sight! That’s what it was when I laid my eyes on this recipe just a few brief days ago in Thee Finnish Food Blog, Pastanjauhantaa. The recipe originated from a Finnish glossy food magazine Glorian Ruoka and included a whole HALF a decilitre of sugar. A genuine paleo monkey such as myself of course arrogantly sweeps away even the thought of adding sugar in food and so I just skipped that one ingredient, whistling like Piglet. Still, the result blew me away. As well as the rest of the eaters. Oh yes, this one’s a keeper. Indeed it’s not the best quality paleo salad there is since it includes a whole lotta mayo but you gotta get your omega 6s somewhere to balance the omega 3s from all the grass-fed beef and wild-caught salmon 😉 (or the lemon tasting bottle, to tell the truth). You are welcome to prepare your own mayo (I can has mayo!) but I just went with a store-bought this time. Tear the broccoli florets in a bowl and chop the onion(s) along them. Roast cashews on a hot pan, set aside. Leave the bacon until later. Prepare the sauce. Mix the sauce and blend it among broccoli and onion. Let the salad sit in the fridge for about two hours. When it’s time to serve the course, bake bacon until crispy and cut it in pieces. 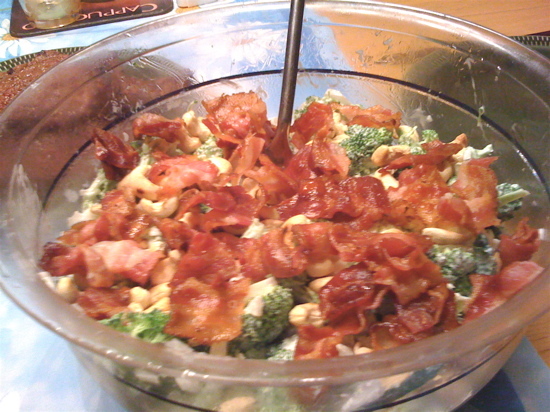 Spread cashews and bacon bits over the salad and dig in! …it’ll be gone before you have time to say HOLY CATS! Oh my god, I am going to LOVE this! Luolanainen, yes you are! ;-D The photo doesn’t (sadly) do this justice. It’s beautiful, this beast. Kukka, well, for one some social pressure works… Tho I DID taste some good amount even before the frigde. I hear ya! But maybe if you do a double batch? Hi! Do you prepare mayonnaise by yourself or do you count on labels which can be found grocery stores? This salad stoled my heart and I haven’t even tasted it yet! 🙂 Thanks for sharing this receipt, I’m defenitely going to try this.